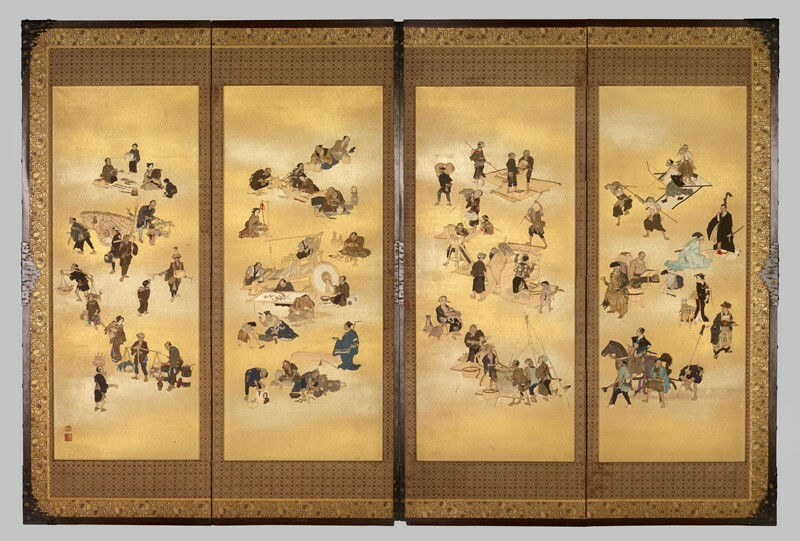 A four-fold screen, each panel applied in relief with silk figures depicting the Four Classes of Edo Japan. The reverse with a painting on silk of crows. Signed with two seals; illegible and ? Setsugan, and bearing the date 1st month 1893. 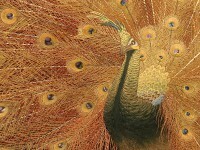 The technique of oshi-e is one padded silk relief; silk wadding is covered with dyed and painted silk, adhering to the background paper. The fineness of detail is remarkable, and this screen would have been an extremely expensive item, particularly as the hard-wooded veneered frame is mounted in elaborate and very heavy soft-metal mounts, probably supplied by a former sword-fittings maker. The very heaviness of the screen as it precludes the possibility of its sale to a Japanese buyer unless he lived in a European-style house. Its sheer quality suggests that it was made for one of the major International Expositions at the end of the nineteenth century; indeed the date 1893 found on a paper at the waist of a figure in the second uppermost register of the left-hand screen (the figure pulling a handcart) suggests that this would have been the World’s Columbian Exposition in Chicago of that year. Our inability to read the uppermost seal, and our doubtful reading of the lower seal (? Setsugan) makes it impossible (so far) to find any record of the screen in that exhibition. The subject-matter is the somewhat outdated one of the Four Classes of Edo period Japan; these had, of course, been abolished at the beginning of the Meiji period in 1868. Nevertheless, they are here represented one for each panel. 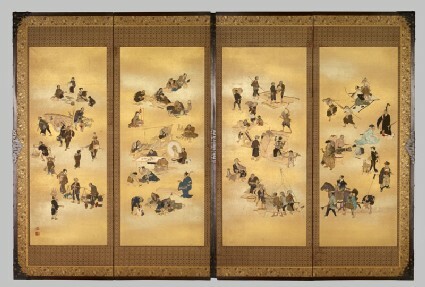 Screens read from right to left, so the right hand panel represents the samurai and the warrior class. The second fold represents the farmer, here entirely occupied in the production of rice. The third fold depicts the craftsmen; hat-makers, wood-turners, a woman fan-maker, a basket-maker, a woman braid-maker, a sculptor, weavers, an embroiderer, an umbrella-maker and a potter, sword-smiths, a carpenter and bronze-casters. The left-hand panel represents the merchant class, the lowest class in society.